My senior year of high school my family and I went on our one and only foreign vacation together (seriously, Canada doesn’t count). We went to Rome. I have been back since, but still that first trip stands out in my memory. I remember finding a comfortable, neighborhoody restaurant that we returned to for dinner a few nights in a row. I remember buying what were at the time the coolest pair of shoes I’d ever seen let alone owned. 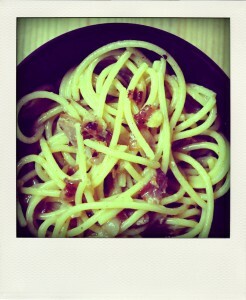 And I remember the day when my mother, father, and sister all ordered Spaghetti Carbonara for lunch. I don’t recall what I had, probably because it wasn’t nearly as exciting. Their bowls came to the table laced with pancetta and topped with a single raw egg. At the time I was too much of a wuss to deal with raw anything, including egg. I don’t know exactly when I got over my fear of raw food, from sushi to eggs, or when my own carbonara obsession began. Two years out of college I made Spaghetti Carbonara for my roommate using a Mario Batali recipe. Just before serving I cracked a raw egg over each bowl of spaghetti and instructed her to quickly mix it in. The trick about carbonara is that the residual heat from the pasta lightly cooks the egg, making it safe to eat. It was divine. 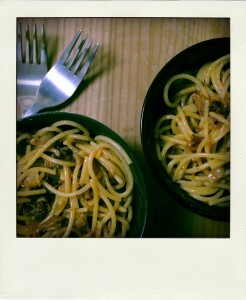 When my now husband and I moved in together we started making carbonara all the time. We experimented with types of pastas and meat, with or without garlic, cream, and onions. Spaghetti Carbonara has become our signature dish. It’s relatively simple to make and makes use of staples (ok, we don’t usually keep bacon around, but it’s easy enough to find). In the time since we’ve been making it, we’ve learned a few things. 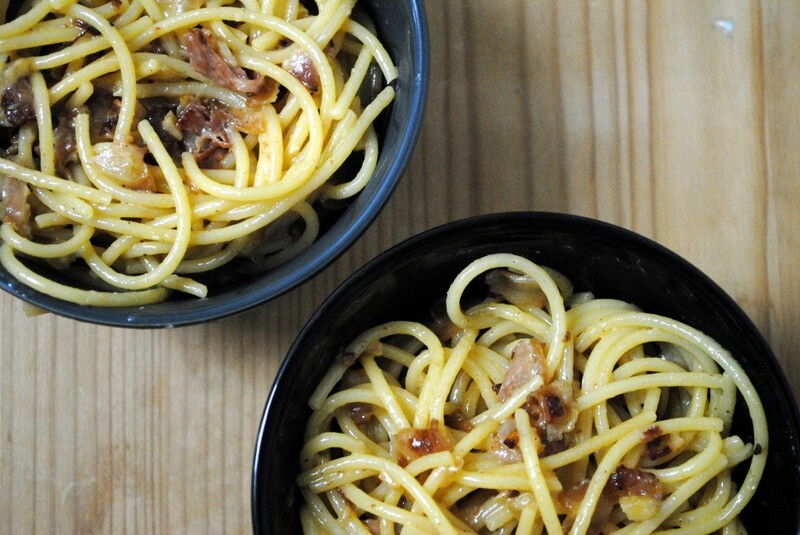 There are a few keys to making good carbonara, at least the way we like it. Number one is to start with good pasta. You can get away with using cheapo pasta in most pasta dishes, but somehow with carbonara it all comes through. Bad pasta easily becomes gummy. Our favorite is DeCecco. The next thing is to get the bacon or pancetta nice and crispy. Not burnt (we’ve tried it that way too), but crispy and browned. 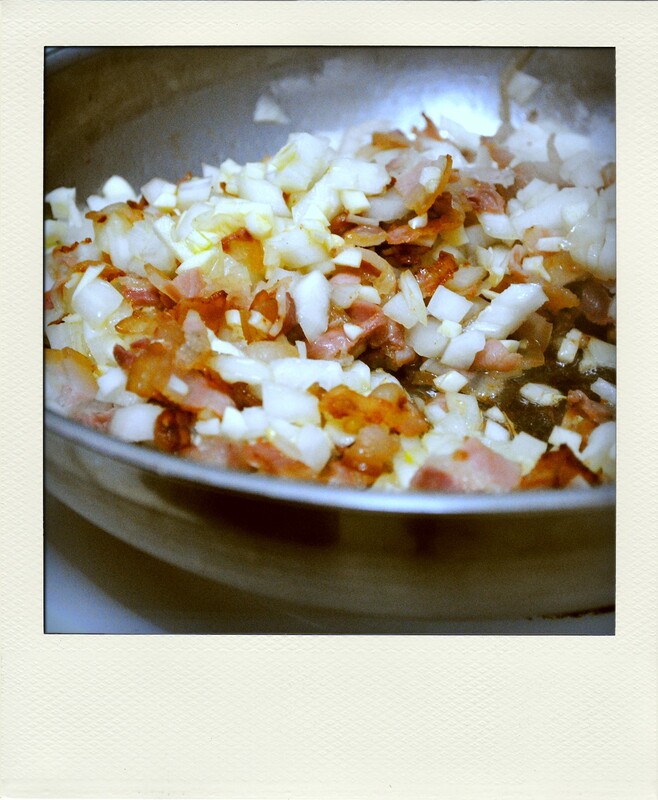 Adding the chopped onions in once the bacon is almost ready gives the onions even more flavor. Only drain the pan of fat if there is an absurd amount (depending on the quality of the bacon this will vary greatly). If there’s not too too much keep it – this imparts even more flavor and moisture to the dish. Many (Americanized) Spaghetti Carbonara recipes call for cream. Don’t do it. Done correctly, the eggs and cheese will create a creamy coating for the pasta that is far more elegant than cream. The one unorthodox thing we do is add garlic. I don’t care what you say, garlic just makes it taste even better. Another thing I’ve learned: don’t try to double the recipe to make carbonara for a crowd. I tried and it was too difficult to mix in the egg efficiently so I got a lumpy mess of sticky, not particularly good pasta. 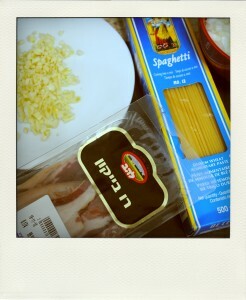 For the purists out there, there are six ingredients in carbonara: pasta, pancetta, eggs, Parmesan, salt, and pepper. As mentioned we include onions and garlic and often use bacon in place of pancetta. And if you’re willing to go out on a limb, there are any number of variations that can be made. If you’re looking to make the dish vegetarian or just don’t have bacon, proceed as normal and you’ll end up with something similar to another Roman dish, Cacio e Pepe. I’ve also had surprising success with vegetarian bacon, not something I’m usually a fan of. The other night, in need of a quick pantry dinner, Evan came up with a new variation. He named it Kosher Carbonara for its lack of pork product. Essentially we swapped the bacon for red peppers and ended up with a protein-filled, inexpensive veggie meal. The truth is that once you stray it’s not carbonara anymore, but that doesn’t make it any less delicious. Cook the spaghetti in a large pot of boiling water until al dente. Drain, reserving a cup of the pasta water, and set aside. Add the bacon to a large, hot pan and cook, stirring frequently, until browned and slightly crispy. Drain some of the fat if necessary. 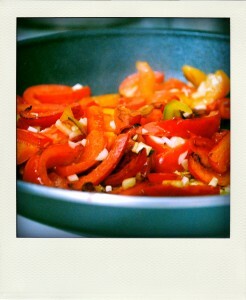 Add the onions and garlic and cook until softened, about 8 minutes. Carefully transfer the spaghetti to the pan and toss to coat the pasta. Remove the pan from the heat and crack the eggs over the spaghetti. Using tongs, vigorously toss the pasta until the egg is fully incorporated and the pasta is coated (if the pan is too hot or the spaghetti is not mixed vigorously enough you’ll end up with scrambled eggs). Add the Parmesan and toss to combine. Season with salt and pepper. The spaghetti should be fully coated and have a sheen. If it needs more moisture mix in a little pasta water at a time until the desired consistency is reached. Serve in a bowl and top with additional grated Parmesan and freshly ground pepper. 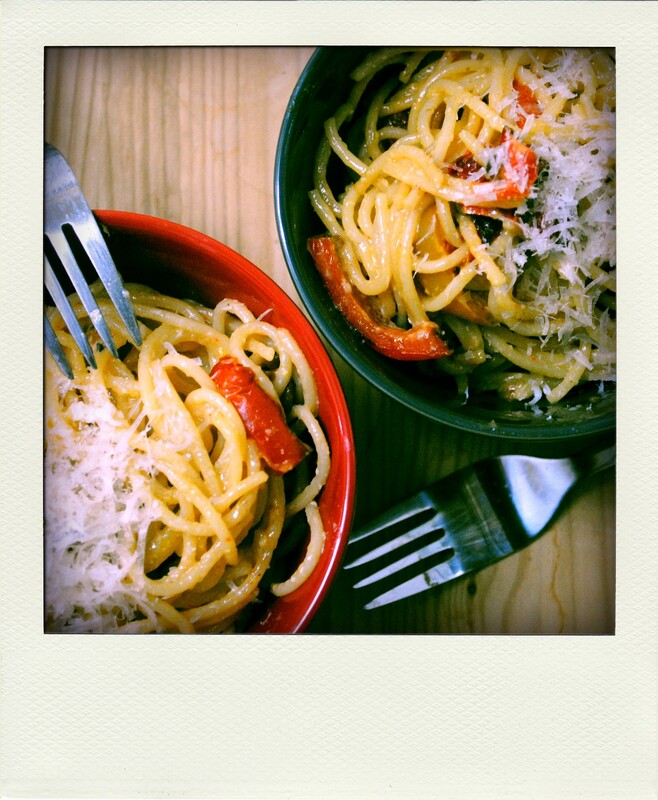 The red pepper “carbonara” sounds delicious – I will definitely try it! I just realized that the package says “Raw Bacon” in Hebrew, spelled out phonetically. That is amusing.